Let’s take a step back and start with a universal truth: Website owners want visitors. If you’re starting out, you want some. If you already have some, you want more. If you have a lot, you still want more—more visibility, more visitors, more success for your web property. However, if a person doesn’t know your site, product, or service by name, there has to be a way for them to find you…right? Correct! Visitors find websites via queries on sites called search engines. These search engines, such as Google and Bing, index the internet and try to correctly match a user’s search query	The word or phrase that a person types into a search engine in order to find what they’re looking for. with relevant pages on the internet. The better the search returns, the more likely a person is to click through and interact with their desired content. If you are a website owner who wants to receive more traffic, both organic and paid, you need to optimize your site structure and content so that search engines recognize, value, and place your web pages highly on Search Engine Results Pages	A list of results appearing in a search engine in response to a person’s search query. SERPs contain organic results as well as ads. (SERPs). To use an old fable to aid comprehension, consider SEO as the tortoise and PPC as the rabbit (or hare). Where SEO is slow and relatively constant, PPC starts and stops instantly. This whole process, optimizing for and ranking highly on search engines, is known as Search Engine Marketing	A form of advertising that allows you to bid for your advertisement to show alongside organic search results for keywords. , or, more simply, SEM. A clear, actionable SEM strategy is one of the most critical pieces of any modern marketing approach. If you succeed at SEM, your website will receive more traffic, your business will see more conversions (i.e., leads, revenue, brand awareness), and you will outperform your competition. Now that you have the foundational concept in place, we can discuss two of the three major types of SEM: Search Engine Optimization	The practice of making improvements to a website in order to increase traffic and visibility in search engine results. (SEO) and Pay-Per-Click	An advertising model where advertisers pay when people click on their ad. (PPC). 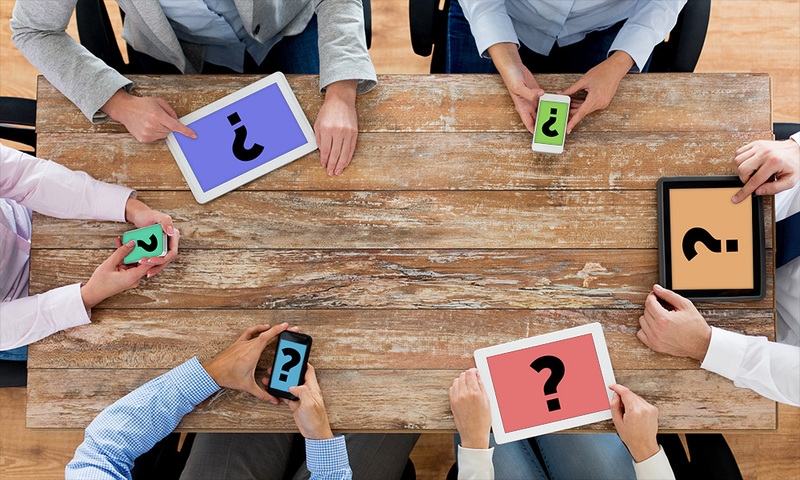 What is SEO and What is PPC? There are two major differentiators between SEO and PPC: time and cost. The first, and most important difference, is cost. Traffic generated through SEO is free. Traffic generated through PPC is paid. So what do “free” and “paid” mean in this context? Free means there is no associated cost with a user clicking on your organic search engine listing and visiting your website. Paid means that for each click on a sponsored listing (i.e., your ad) there is an associated cost. The second difference, time, has to do with the flow of potential visitors. While Pay-Per-Click is an instant way to generate traffic, SEO is a mid- to long-term strategy that builds sustained organic volume. PPC is quick: Enter your credit card, choose targeted and relevant keywords	A word or a phrase typed into a search engine, which businesses can target as part of their advertising campaigns. , write an ad, and traffic is at your doorstep. Alternatively, successful SEO campaigns can take at least 3-6 months to see top rankings, sometimes longer. If you think that is too much of a wait, consider the fact that over 90% of searchers won’t click on a paid ad—revealing SEO as an essential approach to acquiring the largest possible share of available search traffic. SEO helps your website rank highly due to the natural link between a user’s search query and your content. PPC displays an advertisement when a potential visitor executes a pre-targeted search query. There is much more to cover after this high-level overview of SEO and PPC, so let’s dive into more details about which approach is right for you. Search Engine Optimization is the only way to receive free, sustained traffic from search engines. It is the structural foundation upon which your site is evaluated (by the ever-shifting Google algorithm) and displayed to the billions of daily search queries executed around the world. Search Engine Optimization is the only way to receive free, sustained traffic from search engines. At VELOX Media, we focus on Google because in 2017 it generated over 79% of all global desktop searches. Bing, Baidu, and Yahoo drove 7%, 6.5%, and 5%, respectively. Within SEO there are two major sub-focuses: On-Page SEO and Off-Page SEO. As the name would imply, On-Page SEO	A practice of improving site architecture and content to improve ranking. , also referred to as On-Site SEO, means making on-the-page improvements to site architecture and site content. Quality On-Page SEO allows Google (and other search engines) to see that a site is built correctly with properly formatted content that has a distinct relation to a user’s search term. Site owners have the most control over On-Page SEO through their ability to manipulate factors such as keyword-targeted content, search engine accessibility, strong metadata, and more. Off-Page SEO	A set of activities outside of the boundaries of your website to improve ranking signals for search engines. , also known as Off-Site SEO, involves optimizing ranking signals for links to your site, trust in your site, and social shares of your content. Personal identifiers of the searcher, such as location and site visit history, are also taken into account as Off-Page SEO and search relevancy elements—but these cannot be optimized. To get a clearer picture, let’s cover some positives and negatives of SEO. Sustained flow of free, contextually targeted traffic. Increased brand authority/integrity by ranking highly. Higher click-through rates (CTR) and ROI compared to PPC. Helps augment social media visibility (and vice versa). Takes time, most likely months, for first page SERP listings. A significant challenge to rank for competitive search terms. No control over Google algorithm changes. Full On-Page and Off-Page SEO requires a considerable time and resource investment. PPC is one of the most effective methods to drive instant, highly-targeted visitors to your website. These ads can increase brand awareness by 80%. Not only that, but research shows that when consumers have the intent to purchase, 65% will click on a paid advertisement. This leads to an average return of 2-to-1 for businesses that utilize Google Ads. PPC is a method that, at a cost, can immediately link consumers who have shown purchase intent to a relevant landing page	The first page that a person sees when they reach your website—not necessarily the home page. , improve lead generation or product sales rates, and give you measurable/actionable data on customer behavior. The Pay-Per-Click model is a fascinating mix of the straightforward and complex. At its most simple, PPC means that an advertiser is willing to pay a certain amount for each click that sends a user to their website. At its most complex, PPC involves nuanced ad bidding, user targeting, Quality Scores	A variable, measured from 1 to 10, which is used to determine the order in which ads are listed on a SERP. , site experience optimizations, copywriting psychology, audience retargeting, and much more. So, what are the primary variables affecting overall PPC costs? Easy. What keywords you want to target, how much you are willing to pay for each click, and how long you want your ad campaign to run. Keep in mind there are many more complexities beyond these three items, but these form an important foundation. To further understand this approach, let’s dive into some positives and negatives of PPC. Sends highly targeted users (intent, location, time of day, device type, etc.). Track ads, actions, and conversions in real time. Ability to retarget visitors who hit a landing page and left without a purchase. Every single click costs money. Can get expensive quickly (e.g., competitive terms, bidding wars, etc.). A click doesn’t guarantee a conversion (you need a strong landing page). Lower click-through rates compared to organic listings	Results from a search engine query that are not paid ads. Now that we have a complete understanding of both SEO and PPC, let’s dig into what separates these two marketing disciplines. The Search Engine Results Page (SERP) is essentially the homepage of the internet. Throughout 2017, Google averaged around 75% of all web searches, which means over 40,000 search queries were processed every second. That’s approximately 3.5 billion searches a day! Depending on the term, a search results page can look quite different from one keyword query to the next, but one thing that will not change is the position and identifiers of organic search listings compared to paid search ads. Paid ads can appear in the central column above and below organic search. The position of your paid ad has many factors: bid price, keywords in the ad, keywords in the landing page, user interaction rates, and more. Paid ads are separated by a small “Ad” identifier that is below the headline, in green, to the left of the display URL. Organic listings appear in the middle of the SERP’s main column. Your organic search ranking is described via a Page and a Position. Each SERP page has 8-10 organic listings. The best possible organic listing is position one on the first page of results. Your organic ranking is affected by your On-Site SEO and Off-Site SEO, the former of which includes multiple factors: keyword-targeted content, search engine accessibility, strong metadata, and more. 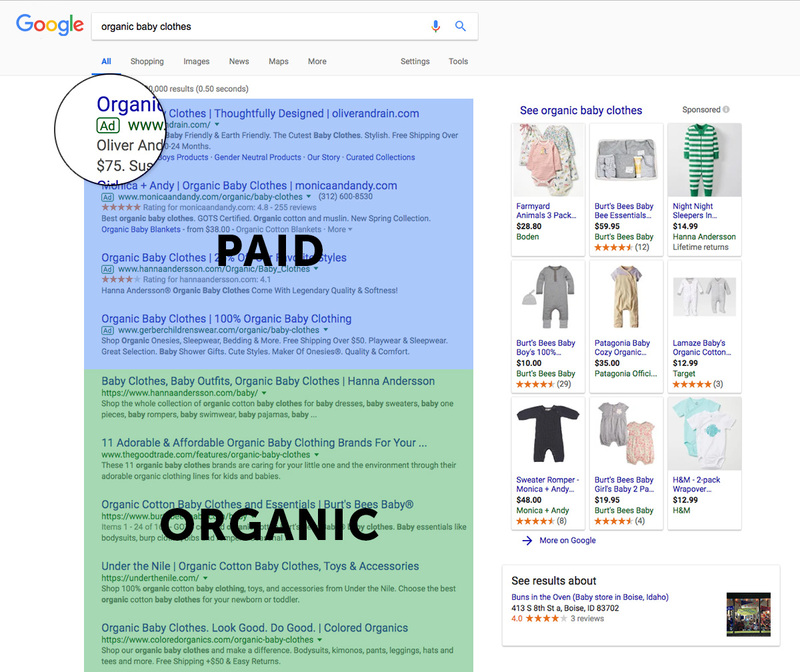 Note: The identifiers of paid ads vs. organic listings have become more subtle over the years, making it harder to distinguish the difference at a glance. Although search results pages have virtually the same look and feel, Google has added dynamic elements known as “SERP features” in recent years. Beyond the familiar blue text listings, these features include nontraditional results such as video listings, related products, top news stories, map locations, and more. Depending on the feature, organic search results can get pushed down and negatively impact CTR. All listings on a search results page are not created equal. Over 71% of all searches end in a first page Google organic click. The top five of the first 20 Google organic listings in a SERP garner over 47% of all click-throughs. The number one Google organic listing in a SERP generates more than 21% of all click-throughs. The data is clear. Users prefer to click on organic listings. Hence the value of SEO. That being said, we are starting to see a shift to more click-throughs hitting paid mediums. In fact, organic searches in 2017 received 25% less desktop CTR and 55% less mobile CTR compared to just two years prior. 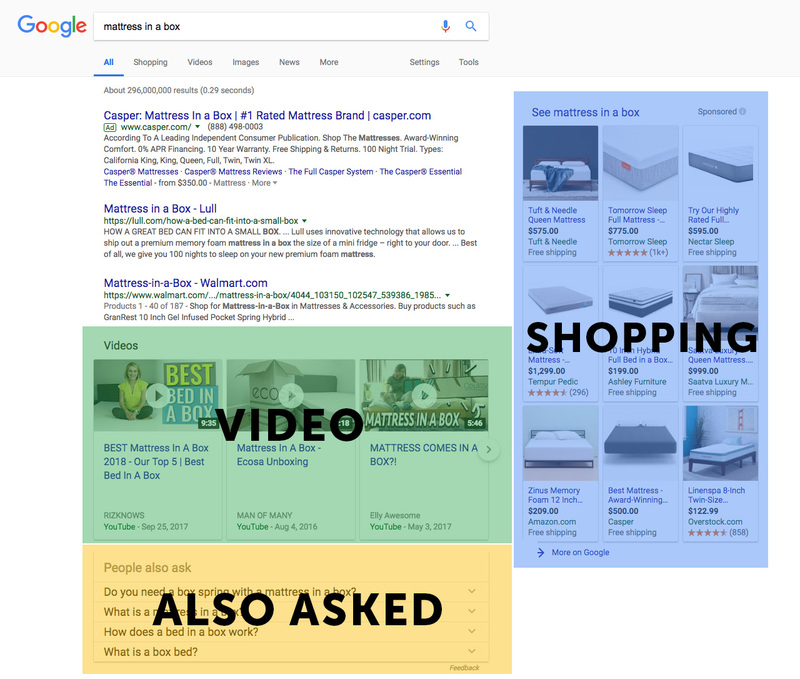 There are multiple factors behind this shift: less visible ad callouts, large Google Shopping carousels in search returns, increased ad size, uptake of mobile searching (location and time sensitive), and more. It means that if your SEO efforts secure a high first page organic ranking on a competitive term, your website will enjoy substantial levels of traffic. Your potential traffic volume from Google Ads is directly related to how much you are willing to spend and the search volume of the keywords you are bidding on. Use the Google Keyword Tool to get estimated keyword volumes to help gauge the traffic potential of search terms within your paid search campaign. We covered the primary differentiator that SEO is free and PPC is paid. Well, that’s true…and not true. Let’s go into the difference in the cost of SEO and the cost of PPC to explain. SEO is extremely competitive. Ranking for high-volume, high-competition search terms with zero investment is next to impossible. SEO is also incredibly complex. A proper SEO strategy involves many assets: keyword research, competitive research, backlink generation, page speed optimizations, mobile optimizations, copywriting, structured data, social data, site architecture, and much more. These all take time and effort to master. You could invest the effort and self-learn, go through trial and error and work out of the Google sandbox for desired keywords—this is free. Unfortunately, the traffic volume buildup is gradual as you move up the rankings, and there are no volume guarantees. The traffic should flow—if executed correctly—but it will take on average 3-6 months before needle-moving changes appear. Hence, the word “free” is a relative term. PPC, with the word “pay” already in the initialism, means that your wallet will be involved. When consumers are ready to purchase, 65% of them will click on a paid ad. Google Ads, the ubiquitous PPC platform, has many ways to manage bids and overall cost. The most popular way to manage cost is by setting a daily budget. Google then multiplies this by the average number of days in a month (that would be 30.4) to create your monthly budget. This monthly total is the number that Google will not spend over. The spend limit is nice, but how do you know what your marketing budget should be in the first place? How does PPC fit into my overall marketing strategy and budget? How much are PPCs for my targeted keywords? What numbers do I need to hit to be profitable based on my campaign goal for brand awareness, lead generation, or sales? Next, use the answers to guide your initial PPC budget by understanding your target key performance indicators (KPIs) and working backward to a campaign budget total that will allow you to hit profitability. If you’re just starting out, it helps to be extremely picky with your keyword selection. That means only setting bids for terms that are relevant to your business and using negative match keywords to reduce irrelevant traffic and save on wasted spend while appealing to the right users. SEO vs. PPC: Who Wins? SEO and PPC work exceptionally well together. They are not mutually exclusive. Some might even call them partners. PPC allows for quick wins, ideally sending relevant users to an optimized landing page that generates ROI-positive interactions. SEO makes your site more visible to the natural queries that users around the world are typing in each and every second. Together, these disciplines can send your business on an incredible upward trajectory. Talented PPC management directs traffic exactly where and when it is wanted. You can immediately generate interest for seasonal items, specials, new products, and more. When the money stops, the traffic stops. Skilled SEO practitioners shine a light on their business by discovering low-competition, high-intent keywords that will help content be more relevant and engaging for potential users. The numerous click-throughs and extended time on site will tell Google that your result is a strong match and it should continue to move it up the rankings. As this process improves, so does your site authority and backlink profile, both working together to boost your search rankings. One marketing approach won’t get you to the top of the search rankings. But, by using a hybrid marketing plan that combines both intelligent On-Site SEO and a targeted paid search campaign, you can drive the traffic necessary to reach your website goals. Utilize PPC for quick wins and targeted traffic flow. Utilize SEO to increase site appeal to search engines, raise brand authority, and to generate a slower-to-arrive but constant traffic flow. Whether you want increased brand awareness, lead generation, or product sales, the combination of both SEO and PPC will grow your business and your bottom line.